Rita Carla Francesca Monticelli is an Italian science fiction and thriller author. She has lived in Cagliari (Sardinia, Italy) since 1993, earning a degree in biology and working as a writer, scientific and literary translator, and freelance web copywriter. In the past she also worked as researcher, tutor and professor's assistant in the field of ecology at "Dipartimento di Biologia Animale ed Ecologia" of the University of Cagliari. As a cinema addict, she started by writing screenplays and fan fictions inspired by the movies. She writes original fiction since 2009. Between 2012-2013 she wrote and published a hard science fiction series set on Mars and titled "Deserto rosso". The whole "Deserto rosso" series, which includes four books, was also published as omnibus in December 2013 (ebook and paperback) and hit No. 1 on the Italian Kindle Store in November 2014. "Deserto rosso" was published in English, with the title "Red Desert", between 2014 and 2015. The first book of the series is "Red Desert - Point of No Return"; the second is "Red Desert - People of Mars"; the third is "Red Desert - Invisible Enemy"; the final book is "Red Desert - Back Home". She also authored a crime thriller titled "Il mentore" (2014), a science fiction novel titled "L'isola di Gaia" (2014), an action thriller titled "Affinità d'intenti" (2015), and a science fiction novel titled "Per caso" (2015). "Il mentore" was published in English by AmazonCrossing with the title "The Mentor" on 1 November 2015. All her books have been Amazon bestsellers in Italy so far. She's also a podcaster at FantascientifiCast, an Italian podcast about science fiction, an Italian Representative of Mars Initiative, and a member of the International Thriller Writers organization. She's often a guest both in Italy and abroad during book fairs, including Salone Internazionale del Libro di Torino (Turin Book Fair) and Frankfurter Buchmesse (Frankfurt Book Fair), local publishing events, university conventions as well as classes, where she gives speeches or conducts workshops about self-publishing and genre fiction writing. As a science fiction and Star Wars fan, she is known in the Italian online community by her nickname, Anakina. Thirty years after the Mars exploration mission Hera, whose crew died in mysterious circumstances, the ensuing political issues that slowed NASA's race to conquer space have finally ended. This time the five members of the new Isis mission will not travel the 400 million kilometers for a short visit. This time they are destined to become the first colonisers of the Red Planet. 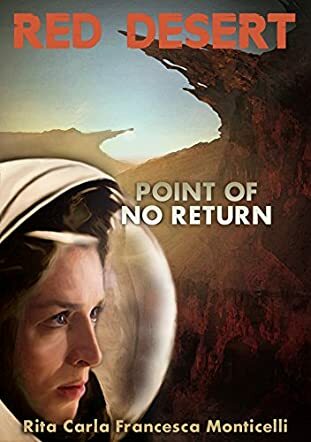 I loved the premise of Red Desert: Point of No Return by Rita Carla Francesca Monticelli. Space travel is such an interesting topic, especially when you throw Mars into the mix. I love science fiction that reads like contemporary fiction, that really makes sense, and is as plausible and believable as reading the newspaper. These topics are so relevant and in the news right now that this book is very timely and will benefit from the fact that we are looking for water on Mars as we speak. Any of the events in this novella could be happening in space right now, and that's what makes this story so interesting. This story really reminded me of Instellar, especially Matt Damon and Anne Hathaway's characters. I kept envisioning them in my mind as Anna makes her escape. When she doubts her colleagues, I doubted them along with her. When she made bold moves and took daredevil steps, I worried about her sanity and her motivations. Would she have enough oxygen? What was she looking for? Why would she risk her life for it? What could be so important? These were all questions that flooded my brain as I flipped page after page, waiting impatiently to get to the end. I just had to know how it all worked out, and I prayed that it did all work out because I was so invested in Anna's character by the end of the story.